One of the most obscure but earliest documents to recall the Pacific Coast of British Columbia is a journal published by an assistant surgeon on the Discovery and later the Resolution. The first edition of William Ellis' diary appeared two years prior to the release of Cook's narrative. Needing money, Ellis contravened the dictates of the Admiralty and sold his narrative to a bookseller for 50 guineas. The Resolution left Plymouth in July of 1776 and the Discovery set sail in August. They rounded the Cape of Good Hope on November 30, reaching Tasmania (Van Diemen's Land) and New Zealand before heading north to discover the Raratonga and Cook Islands. The crews rested for four months at Tahiti. Captains Cook and Clerke discovered and named the Hawaiian Islands as the Sandwich Islands, then proceeded to the B.C. and Alaska coast. 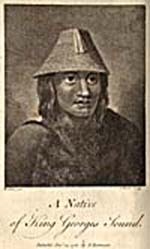 William Ellis recalled the killing of Captain Cook upon their return to Hawaii, followed by Captain Clerke's stint as commander until he succumbed to tuberculosis shortly after embarkation from Petropavlovsk in Alaska. Captains King of the Discovery and Gore of the Resolution returned to Petropavlovsk, buried Clerke, and sailed back to England. Ellis' narrative was reprinted several times, although Ellis did not receive a share of the profits, having relinquished his copyright for a lump sum. The National Library of Canada retains a copy of Ellis' two-volume An Authentic Narrative of a Voyage Performed by Captain Cook and Captain Clerke (London: Printed for G. Robinson, J. Sewell and J. Debrett, 1782). [Alan Twigg / BCBW 2003] "1700-1800" "English"